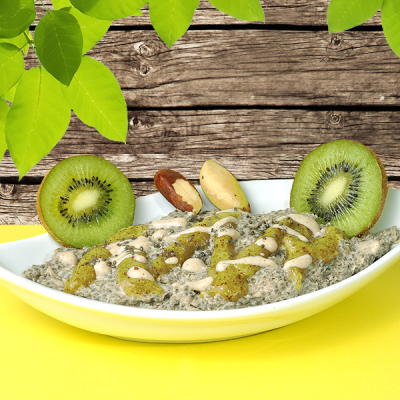 Crunchy Brazil nut pudding with protein-rich chia seeds, fruity kiwi sauce, golden lucuma and mildly sweet mesquite powder. A dessert to fall in love! Peel your fresh kiwis and put them together with Lifefood lucuma powder and agave nectar in your blender. Add a teaspoon of psyllium husk. Now your raw kiwi sauce is ready. Enjoy every moment. For you delicious Brazil nut chia pudding you need to blend your raw brazil nuts, sun-dried dates, water and Lifefood mildly sweet mesquite powder into a tender pudding. Add the chia seeds which will give your pudding a crunchy consistency. Take little dessert bowls and put your pudding inside, top it with your fresh kiwi sauce and let the pudding swell slightly. Now your raw dessert is ready for serving. Made with love!